I, like most people, love food. Specifically, healthy food that tastes good and doesn't cost oodles of money. Unfortunately, I am a beyond-broke college student, and what's affordable to some folks is oodles to me. Anyway, I've been snacking on these all week, and as I came closer and closer to emptying the precious bags, I thought I'd try to create my own. But by the end of the thing, I had added another bag of coconut, crushed-up pecans, and cashew butter (organic! #saleshopper). Which means they were nuttier than I was hoping for, but still delicious. Next time, I will probably try to get them to stick together without cashew butter, I'll do less agave, and I may leave out the salt altogether. Still, the pecans were a surprisingly good complement to the coconut in lieu of almonds (which we actually had, but they would have required me to walk ten feet instead of reaching into the cabinet behind me, so). The real thing on the left, my thing on the right. 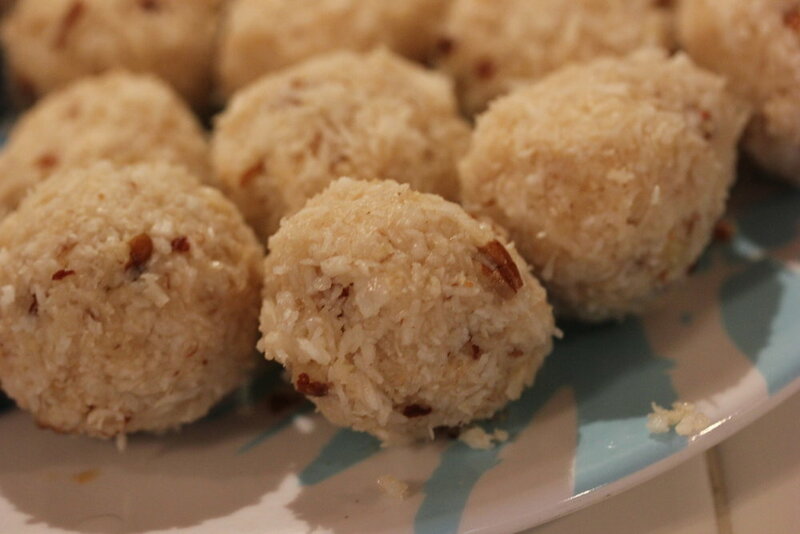 Now, I won't attempt to convince you that these sweet 'n' fatty lil cocoballs are super healthy. BUT if it's these or a slice of Kroger cookie cake, your body will thank you for choosing the 'roons.